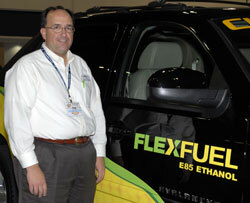 The Chairman of the Board for the National Ethanol Vehicle Coalition. They are on display here at the Commodity Classic trade show. I haven’t had a chance to spend much time with NEVC before so I interviewed Steve to learn more about the organization. Greg says that they are a real technical resource for consumers and anyone who wants more information about E-85. One of the highlights of their website is an online E-85 pump finder which he says the staff works very hard to keep updated. He says that there continues to be a very high level of interest in E-85 and that the crowd here seem to be very knowledgeable about it.